The AUSTRALIAN SPEEDWAY RIDERS ASSOCIATION Inc.
Click on the VSM name to view some top photos from the pages of the no longer published - Vintage Speedway Magazine in the UK. Have a look at some great photos from John's career. Click on his name. Johnny Hoskins the "Father of Speedway" called him "Buck" after a comic strip hero in the Sunday papers. Click on Keith's name for a tribute to this great Aussie sportsman. Some photos from Bob's career. 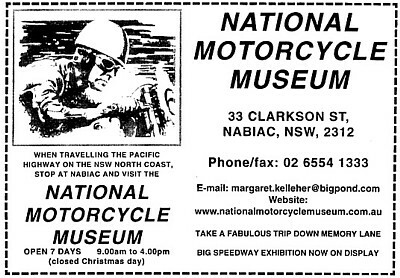 The Veteran Speedway Riders' Association of Australia was formed by a group of Vets in 1991. From those humble beginnings the association has grown to have a membership of around 400 in 2019. 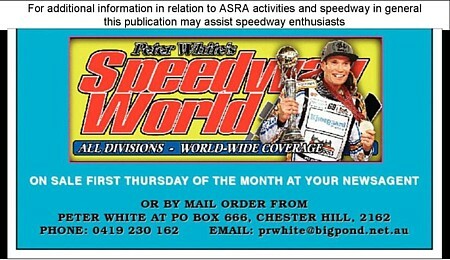 The Association name was changed to the AUSTRALIAN SPEEDWAY RIDERS ASSOCIATION on June 5th. 2014.We look forward to the support of all current ASRA Members and for some of you younger riders and fans from the '70s, '80s, and '90s come on ! join us NOW.......and let's get stronger. The Association was Incorporated in August 2016. This website was created in 2002 as a private website and is maintained under a yearly rental agreement for the ASRA. Would you like to hear the sound of a J.A.P. engine or hear Stuart Mountford riding a few laps of his Jawa at Barleigh Ranch ?, if you would click on the sounds heading above. You can't race Speedway much closer than this ! Ashfield Team at Bristol -1949 - Rol Stobart, Eric Salmon, Ken Le Breton, Roger Wise. 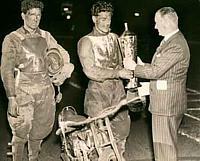 A new small Brian Darby website with photos and tributes to our early Speedway champions. Would you like to let us know that you have visited our site or of your Speedway history ? Classic Speedway # 44 - from the publishers of The VintageSpeedway Magazine and Backtrack Magazine. This new publication replaces The Vintage Speedway Magazine which is now discontinued after running for 15 years. CLASSIC, still with early Speedway features and you can now travel on into the 50s and 60s. Click on the Backtrack banner below for purchase details. All the ASRA memorabilia is now on display at the Nabiac Museum. To go to the Museum website click on the link below. Click here to open a page showing up & coming events for ASRA members. Links to interesting websites - click on the logos below. A new inovation for your association's website - a page for selling or buying your requirements in a Speedway bike or parts. For private sales or purchases ONLY. It is a free service. A Brian Darby website for lovers of Solo Speedway - worldwide. The unofficial website for Newcastle Speedway - UK. Travel to the Sunderland Speedway site in the UK. join us - you can do that now by clicking onto the APPLICATION FORM heading below which brings up a PDF for you to download by printing - fill it out and send with cheque or money order to the address on the bottom of the form. It's a great Australian Association and having enthusiastic members keeps our history alive - please join us ! Click here to print Membership Application Form. A PHOTO DVD of photos from Re Union dinners and club outings photographed over the years 1995 to 2018 by club member Brian Darby. Running time is 17.40 minutes and it is a chance to relive and enjoy those moments from the past with fellow members and friends. $ 25 Au plus $3 P&P ( within Australia.) Overseas P&P $ 9.00. Allan Whitfield Roper -aka-Allan Blackburne - a true Aussie Speedway legend. Click here for Allan's history. 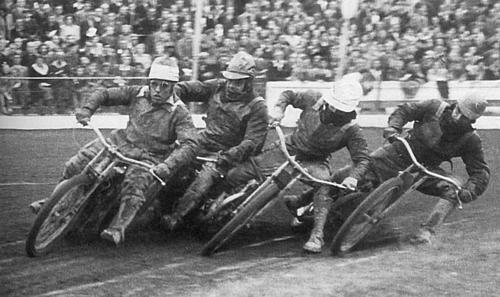 A new webpage on Brian Darby's Vintage Speedway website. A collection of amateur candid photos from the 40s and 50s to which older club members may relate. Click on the Molly heading. Sad to report the passing of legendary UK Speedway Historian - John Chaplin. John is shown here, on the left, with ASRA member Ove Fundin at Ove's book launch in the UK. John left us on March 20 2019 and his Service was on April 10 2019. He was a good friend to us all worldwide in Vintage Speedway.